One of the blogs I loyally follow is IKEAhackers.net because it inspires me to think outside the box and keeps my creative mind active. The lightbulb moment came when I saw a handful of LACK tables pushed together to form a larger table in an IKEA catalog, and I wondered how tall two LACKs would be if they were stacked on top of each other. A glance at the dimensions listed in the catalog and a quick calculation and – lightbulb! Stacked, they were almost 36 inches. At only ⅝” shorter than my kitchen countertops, it was the perfect solution. I could create a modular table by stacking LACK tables two high and arranging enough of these side-by-side to get the surface area I needed. Unfortunately, I didn’t take any pictures of the build but it is fairly simple to explain. I bought 12 white LACK tables and my husband and I assembled all of them according to the instructions. We turned half of the tables over and drilled 2 holes in the bottom of each leg (opposite corners of the square leg). In each hole, we either glued a wooden peg (leftover from other IKEA projects) or a small dowel-rod segment. Once the glue was dry, we balanced one pegged table on top of an unaltered LACK and marked were the pegs touched the surface of the lower table’s top. Then we drilled holes where we marked, put some glue on the pegs, and pushed the two tables together (using a rubber mallet when necessary). Eventually, we had 6 double stacked tables. (And they were really easy to get through the doorway!) The stacks were then arranged 2 by 3 where I wanted them in the room, and I used strips of sew-on Velcro around the center legs to keep the tables flush with each other on the top surface. I covered the table with a store-bought cardboard cutting board and I keep it from sliding around with scraps of leftover STOPP anti-slip rug underlay (also from IKEA). The unplanned bonus of the hack was the “shelf” that was created with the bottom layer of tables. I suddenly had places to pile my fabric tubes and bolts, and some large plastic bins fit in the “cubbies” on the floor. Plenty of storage under table now! 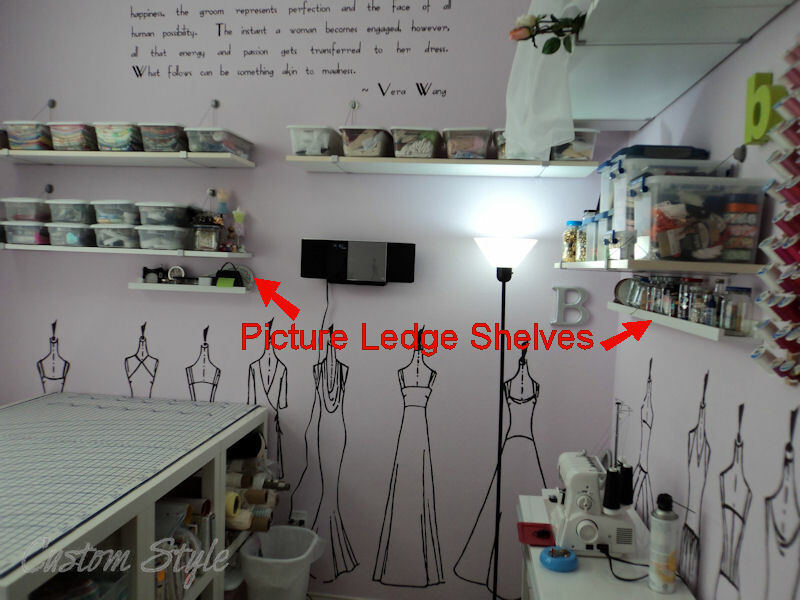 Recently, I purchased a couple of RIBBA picture ledges to use on my sewing room wall as shelves for tiny jars, ribbon spools, and other miscellaneous tools. A few days after hanging them on the wall, I realized that they would be the perfect width for holding my rulers – which I have never been able to find a home for or keep from burying under my projects. I measured the small ledge already hanging on my wall and it was exactly the same width & height as a LACK tabletop! I can’t believe I didn’t think of it before! The RIBBA picture ledge is practically made for the LACK! So I bought two more small RIBBAs and marked & drilled the necessary holes on the sides of my cutting table. (In retrospect, it would have been much easier to mark the holes by lining up the RIBBA with the legless tabletop on the floor, if I hadn’t already built the table years ago.) Then I attached the ledges with 3” drywall screws and moved my rulers into their new home. I quickly discovered the ledge also makes a good pencil tray. 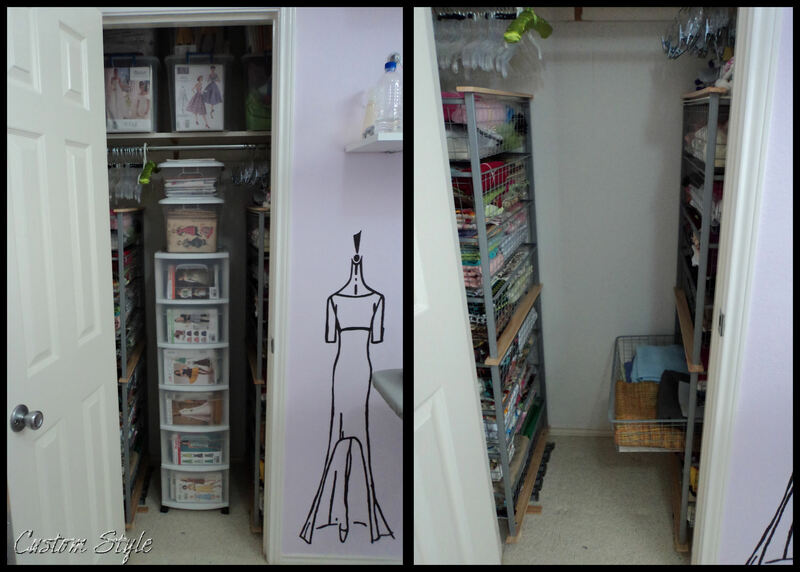 The other major sewing room hack is in the closet where I store most of my fabric and some of my patterns. It used to be a major disaster! I’m sure with more time, I could have figured out a better way to execute the project, but it’s installed and it works, so I’m happy. MUCH better! I roll the plastic drawer tower out to access the IKEA wire drawers. I’m in a Book! So Let’s Have a Givaway! I really think that the ruler/pencil holder is my favorite part. It is neat that it was such a simple thing. This is a great sewing room crash. You are sure organized now. I really like the artwork on the walls. The use of the small tables will also work for a garage workshop with an added wooden top. I also really like the tool tray for the rulers, pencils and anything else. Good job. I am truly jealous of your crafting space. Its so organised and the colour and wall designs make it look like a calming crafting space. I can only see it on the edge of one of the pictures but I love the cotton reel storage on your wall. What a brilliant idea! I love this! I really like what you have done with the lack tables, it is so innovative. I may have to follow suit. Perfect spot for sewing and crafts. Great job! you can be very proud…and I will keep it in my mind thanks a lot!!!!! I am glad you like my blog! I briefly studied the German language in college but (sadly) I only remember a few vocabulary words. Your word creation (homely) is actually a word – it means “plain” or “common”. 🙂 Perhaps the word you meant is actually “homey” which means “comfortable” or “inviting” or “home like”. Even native English speakers mix them up. Your English is very good! Thank you for your comments! what a wonderful sewing room you created! I am sure it is a pleasure to work there. where did you get the wall decals?? i too have used ikea alll in my sewing room. however i have been trying to figure out a LARGER cutting table. Mine is an expedit 2×4 turned on its long side with a table top screwed into the top. works, but would like a larger area. The “decals” are actually hand-painted Vera Wang sketches. I found them in a book in my personal library and copied them onto transparencies. Then I projected them onto the wall, traced the outline with a pencil, and painted in the pencil outlines. After I traced everything, I think it took me and my sister (thank goodness I had her help!) 2 or 3 days to paint them all in – our hands were sore for days! Good luck with your table! I love that I can make mine bigger if I ever decide I need to. I’d be happy to answer any questions you might have. Hi Brooke love your cutting room. May I ask where you got the cutting board from? It Looks like you got one with the same measurements as table top. Can’t seem to find one big enough. Please help. Thanks! =) My cutting board is just the cardboard accordion folded kind you can buy at a store like JoAnn Fabrics – I don’t use rotary cutters, so I didn’t need anything too fancy. I had to cut a few inches off the fully extended length to make it fit the table, but the width was close enough. Ouahou !! I just love it ! I’m exactly searching to organize what will be my sewing room in few weeks (i’m soooo excited ! ), and yours gives me great ideas. I love the ledge for your rulers. I’ll probably do the same. I have been searching for table ideas and I have to say that this one is fantastic! We just got an “as is” house and we are fixing it up. We had a “bonus room” and I am lucky enough that this is now my new “sewing room.” I feel blessed!! I ran across your table idea and it’s absolutely terrific! With no closet in the room (and not a very big room to boot) this table idea creates volumes of storage with cost savings!!!!! I am grateful you shared this with us. Many thanks! This is really nice, I hope that I one day can have a room to fit such a great cuttingtable. The idee of stacking tables is great. Thanks for sharing your idees and pictures from your lovely sewingroom. I discovered your great site quite by accident, and AM I GLAD i did! I am building a new home with a special room just for me and my crafts (lucky me, but I have waited a looong time for this opportunity) and was thinking about an island work table. I am very excited to think just how big and useful I could make one out of simple Lack tables and a little DIY. Thank You so much for sharing your wonderful space with us all. I can’t wait to customise my home with lots of great storage ideas like your wardrobe drawers too! 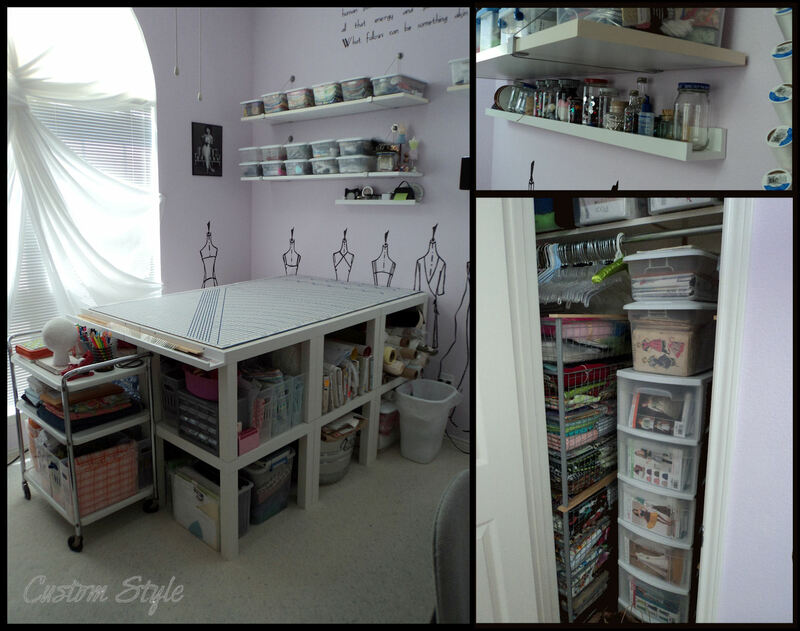 I have some other details of my sewing room that I will probably be sharing in future posts. I just wanted to say thank you for posting this. I stumbled across your blog post while looking for taller tables I could use for cutting out fabric, and I’m so glad that I did. I am planning on going out to Ikea tomorrow to buy my 12 Lack tables. I have a bad back so I would have to take frequent breaks to stretch because of all the stooping I was doing using a regular height table. With all the extra storage this set up provides I can also free up some space in my work room making it a win win win solution to my expanding craft room needs. This is brilliant! I have a counter high work table, but it is not as wide as my cutting mat. I was considering an IKEA Kitchen Island but this is more functional and economical. Thanks for posting this. I came here from a post on the 1912 titanic sewing project facebook page. This is a great idea! I don’t live near an IKEA but I can order these tables online. Thank you so very much for sharing. You solved a big conundrum! Dear Brooke, your instruction and idea with the Lack construction really hit me as the idea I needed to install my own sewing room. I saw your page on Friday, discussed an schemed and planned with my dearest one til late in the night, went to Ikea on Saturday morning, built the whole thing on the same day (including some more shelves a sewing table) and: tata – now I can get all my stash organised, I have a good place for cutting, can sit down to sew, be in my own space in which I can be as organised and creative and chaotic as I want to. OK – I need a little place next to me, for ironing, so that I don’t have to stand up in between. But that is something I can work and think on – the biggest part is done. Thank you so much for sharing this. You inspired us – me and my man, and really made the difference so that I have now my room installed. Someday, I may build myself an ironing table instead of using my standard ironing board because I like a larger ironing surface. All you need for that is a table (in the size & height you want) and some batting, silver-grey heat reflective iron fabric, and some canvas to cover it all. 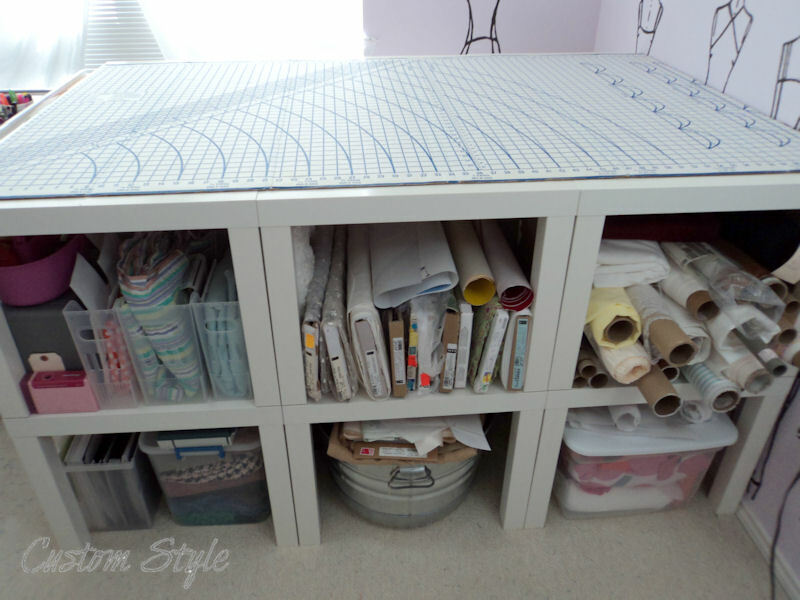 I Love love love the idea of your cutting table!! Thanks for showing! I am really excited now about my sewing/craft space. We are getting ready to transform some of the basement space so I can get my evergrowing craft/sewing stuff out of the living room. It’s funny how it takes on a life of it’s own, seems to grow rapidly and now it has taken up about 1/4 of our living room. I’m sick of it being there and I know my husband is too, but he’s a sweety and doesn’t say too much about it. After reading and seeing your sewing space, I believe that I will be able to use some of your ideas in my space. The tables are an excellent idea! My husband was going to put a board on his pool table so I could use it when I need to but I think your lack tables will be just the thing, I have room and it would be nice to have it closer to my actual area rather than having to move it back and forth from the pool table all of the time. The shelf/ledge attached to the Lack table is also a must, I have a host of things that I would use that for! Thanks so much for posting your pics and description of the steps you took, I think you have done an amazing job and it looks so inviting and comfy! Thanks so much – I’m glad my ideas are helpful! I would love to see your space when you finish! (http://tenthousandsewinghours.blogspot.ca/2013/05/sewing-room-revamp-and-eye-sore.html) I have bookmarked your site and sent the link to my husband! We have been on the lookout for a cheap alternative to our fold up table we got from Canadiantire. My table is too low and my back hurts, the table is not wide enough and I need more storage area. Your BRILLIANT idea will solve all the issues. Thanks once again for the light bulb moment! My next project will be to make the tabletop a pinnable surface. Such a clever idea! What height did your table end up being? I’ve been finding that a lot of tables are really just too low and I’ve resorted to cutting out on my kitchen bench which is waist height for me. You have a great room, and I love the wall art. I may need to clear some wall space to do something similar – perhaps things like sewing tools…. I’d like to know what kind of brain food you eat. Awesome ideas for a “normal-sized” room! Hi i have a question. where did you find that nice big sewing mat? It’s a “Prym Dritz Superboard” cardboard cutting board. Here’s a link to it at JoAnn Fabrics. 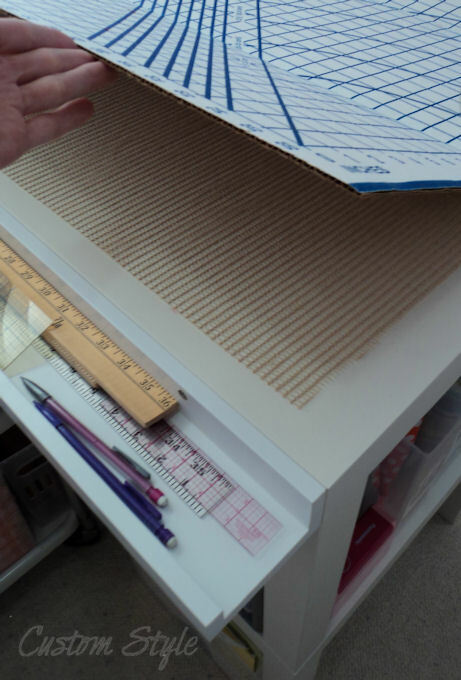 JoAnn’s also have the large cutting mats that you can use with the rotary cutters (60×32″). Usualy cost about 60-75 but if you have a 50% coupon they are more affordable. I got mine from cloth world – which don’t exist in this area anymore, so they can last a very long time. I am curious as to why you wanted your cutting table to be counter height. I am new to quilting and am looking at turning an unused bedroom into a sewing room. My quilter friend insists that in order to cut properly you need leverage and that a cutting table should be table height @29 inches, but counter tops are at least 35-36 inches tall. I am 5’6″ tall. She is shorter. Is it less of a strain on your back when you are taller to cut fabric on a taller table? I am looking to start my sewing room makeover shortly and would appreciate any advice you can give. I’m 5’3″ and I would rather cut on the floor than a standard height table. It kills your back if you have to lean over a low table, and I found myself using my kitchen island more than my old table. Maybe your friend cuts sitting down? In every costume shop I’ve ever worked in, the professional cutting tables are around 38″ tall. It’s not so much about leverage – you just need good scissors (those are your leverage) and the ability to reach across most of the table with minimal bending over. I’m actually planning to upgrade my table soon to add a pinable surface like I always have in other shops, and that will probably add about 2 more inches to the height. What is a LACK table???? Love love love this idea!!! I was trying to decide between the Expedit Ikea Hackers Sewing Table or your version! With a higher table top to relieve me of my back ache, wider table top and a lower cost in materials your version is hands down the winner! And now I will have somewhere to put my 45″ poplin rolls! I love this room so much, thank you for sharing it with us. The lack tables that are listed are 21 5/8 x 21 5/8″. Once u put them together, wouldn’t they be 43.25″ high and would that be to high? I wondered if the tables were sized differently than when this post first was posted. My husband made me the table for Christmas. Thanks for the great tutorial! I am in love with you right now! Thank you so very much for sharing this wonderful table! I do not have an IKEA on my state 😦 A road trip to Atlanta just got into the calendar! What a splendid idea, thanks for posting! May well use this in my workshop to cut PVC fabric – as others have said, the modular design is perfect. 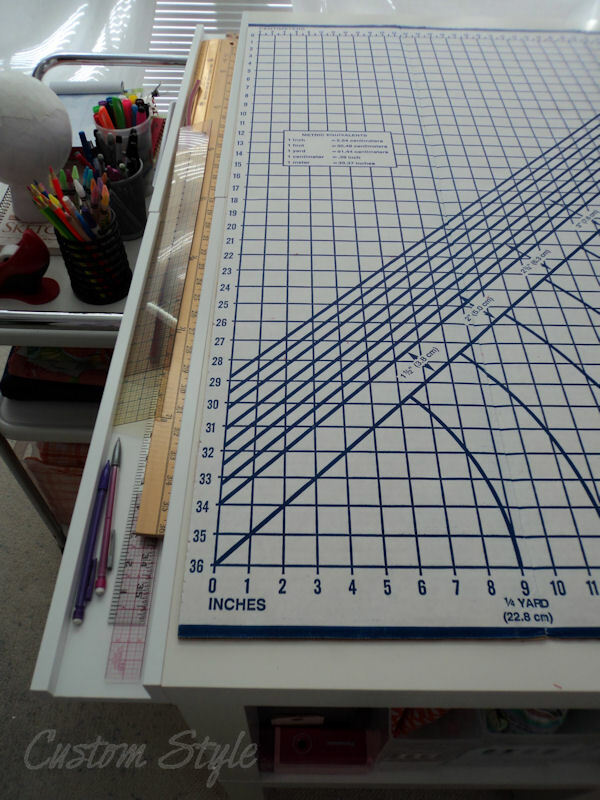 This is exactly what I’m doing, making a sewing space that is at least 35″ because I am tall. I’ve looked at the commercial sewing tables but they are expensive . Can you give me ideas on making a place in this design or table for a sewing machine that can be lowered and stored and can give an even surface between the table top and the sewing machine. You really have great creativity!! 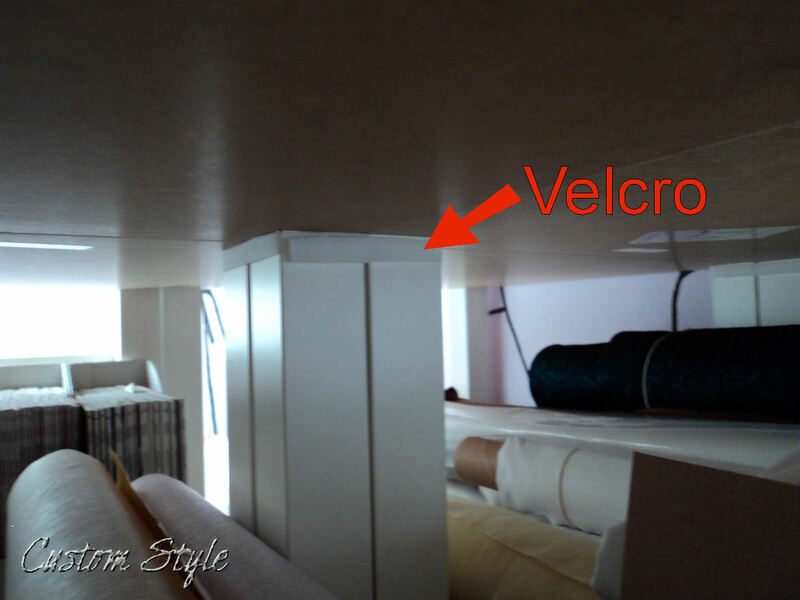 The LACK sidetables are not solid tops, so it would be really tricky to sink a sewing machine in them. I did sink a machine in a hollow-core IKEA desk (I haven’t blogged it yet) but it had solid supports I could anchor to. I’ve known a lot of people who like to set their machine up on top of a cutting table and just sew standing up. I was searching to find a folding craft table when I found your wonderful idea for a large high cutting table and thought how fantastic, your craft room is brilliant and so neat and tidy. We have just had the loft space in our house made into a lovely large craft room as I love all things crafty and wish I had stumbled across your ideas earlier. You are sooooo clever to come up with this idea as it gives such a lot of storage underneath and that would have been great for storing my glass (I am loving learning stained glass) and as I like to stand when cutting the glass, the height issues would have been sorted! My husband will be thrilled when I let him know I would like to change things! Ha ha ! Look forward to many more of your great ideas and many thanks for sharing them. Happy sewing! This was originally posted in 2011, it now being 3 years later how do you feel it’s holding up. I’m about to completely redo my basement workspace and my husband’s only concern is that the LACK tables are made of particle board and might not be as durable. I still have plans to add a pinnable surface to the top of the cutting table at some point. I have found it to be plenty sturdy – I’m not sure I’d want to dance on top of it or anything but it doesn’t feel unstable when I lean on it while working. It’s not wobbly at all. =) I hope you enjoy building yourself one! Have fun at IKEA! I am sold! Ditto most the comments above. Been looking for a table but this will do the job perfectly at a fraction of the price. Thank you so much. Ikea should also be thanking you for the global increase in sales of lack tables. Can’t wait to get started. lol – so glad it’s a good solution for you too! I don’t think it’s possible to be an IKEA shopper and not buy at least one LACK table. This year they’re selling them in light pink and grey! So many color options (including high-gloss white) I didn’t have when I built my cutting table! This is such a brilliant idea! I especially love the flat storage underneath as this is hard to come by. A question: Is there solid wood in the corners of the table, and in the bottom of the legs, to drill through? I know that some parts of the Lack tables are hollow (with just paper inside). It looks like you used solid parts for your attachments, but I’d love to know for sure. Thanks much for your help! I love this cutting table! Quick question – that cutting board on top, are you able to use a rotary cutter or do you just use scissors with that? If so, do you have any ideas on how to cover that board with clear plastic something to make it ok for a rotary cutter? I’m new at sewing, so I’ve been trying to find a larger mat/like surface like this for quick cutting! Thanks for sharing Brooke. My husband’s Christmas present to me is a sewing space (I’m not lucky enough to get a whole room 🙂 so I love seeing your ideas. I didn’t realize you could use a cardboard cutting board. I had been thinking I need to save up for a big self-healing mat. I should have my furniture in the next few weeks and then I’ll post the final pic in IG. I’ll tag you when I’m done. I don’t use my cardboard cutting mat with a rotary cutter, so a self-healing mat has never been necessary for my table. At work when cutter/drapers use a rotary cutter, they just put a smaller self-healing mat down on top of the table when they need it. love you space!! I am working on a small space also, love your cutting table but my space will bee on one wall in my bedroom. I have several things ready that i got at IKEA also. But was wondering, where is your sewing machine? As soon as I get my walls painted I can begin!! I am so excited.!! Hi Brooke! Thanks for continuing to comment on this post even several years later! I have an additional question. I need a smaller table than what you created, but on the IKEA website I saw LACK coffee tables that are 46″ x 30″ x 17″. Do you suppose I could stack and attach 2 of those in the same way you did your LACK end tables? It seems to me that those top shelves would be perfect for storing cutting mats and long rulers. Hi! What are the dimensions of this table? So sorry for the delayed replied! I’ve been working away from home for the past month. My cutting table made from IKEA LACK side tables is about 43.5″ x 64.5″ and almost 36″ tall. way you made the things work for you, especially the tables and picture holders. I will certainly try the holders since I do need wall holders. Thanks so much for sharing your wonderful room, it is a dream sewing room. I just found your blog while I was looking for solutions for a sewing room, which for me is going to be a space in our basement, for now. I was thinking of taking two of the side boards used in your ironing table hack, butting them back-to-back, making a plywood top and encasing it all for ironing, but on one half, putting a large self healing mat for cutting. I don’t know if it’ll work or if the mat will slide around too much. I’ll have to think this through a bit more. Great idea and thanks so much for sharing! I built your ironing table last year, and I just love the oversized top! I’m using an old kitchen table on bed risers for my cutting table. It’s a bit smaller at 36 x 60 and doesn’t have the functional space below, but it’s all I have room for right now, and it’s so much better than what I’ve had in the past. Great job Brooke!